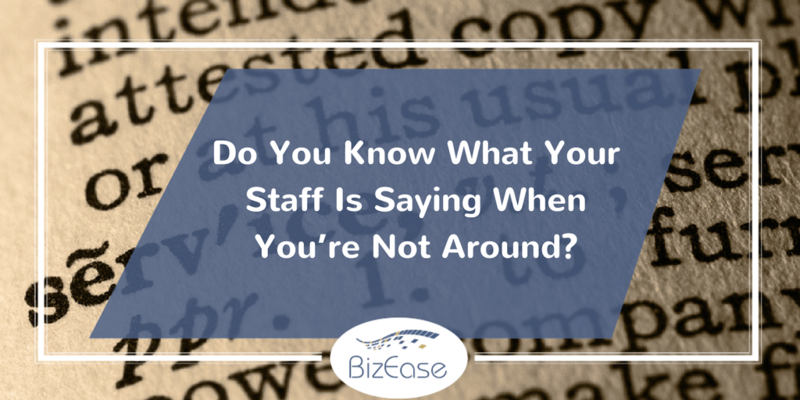 Do You Know What Your Staff Is Saying When You’re Not Around? One of my team members shared a story with me. She and a friend were out for dinner the one evening at a very nice restaurant, celebrating her birthday. It was a beautiful evening, and they were both looking forward to a wonderful meal and a nice cold beer. She said as they studied the menu, they were both torn over the same two dishes. The steak and the lobster linguine. They thought they’d like to share, but it wasn’t easy to share a plate of linguine! When it came time to order, they explained to their server that they would like to share their entrees, and asked if the chef could plate their meals in a way that could accommodate this. The server told them it shouldn’t be a problem (especially since they explained they were there to celebrate a birthday), and off she went. When she returned with a basket of bread, she said the chef wasn’t happy with her about their request. She then went on to talk about his ego, how cranky he was, and that he’d be angry with her for the rest of the evening because she had the audacity to ask him to split up their meals. Every time she returned to the table, she made a dig about the situation, and about how the chef was in such a bad mood after her request. At that point, my team member and her friend were beginning to feel as if they had ruined the chef’s life … resulting in customer service FAILURE! When their meals arrived and they commented on how beautiful they looked. The server said she agreed, but the chef was grumpy when handing her the plates, saying they looked horrible. They ended up leaving the restaurant after a beautiful meal feeling guilty about putting out the chef and the server because of a simple request that could have been denied if it was going to be such a big deal. Good customer service is not a guaranteed skill set. What do you suppose the manager of that restaurant would have thought about the server complaining to customers about the effect their request had on the kitchen? I don’t think he or she would be very pleased. The server was thanked for trying, and my team member and her friend continued to enjoy a beautiful evening. Once the request has been accommodated, that’s that. There should never have been a guilt trip involved. When you have people working for you, you must be sure you’ve clearly communicated what is acceptable customer service, and what is not, at every point of customer or client contact. This applies to team members using social media on behalf of your company. People who answer your phone calls or reply to your emails. When you own a company and a customer has a negative customer service interaction with someone working for you, that will ultimately reflect on you. Make sure your staff knows what is acceptable and what is not. When push comes to shove and everything is boiled down to the basics, you are your business; and poor (or great) customer service always reflects on you, the business owner. Author Bio: Terry Green is the Owner/President of BizEase Support Solutions, an online marketing support company that partners with professional speakers and coaches worldwide to help them turn time into money. You can follow Terry on Facebook, LinkedIn, Twitter and Google+!